Coyotes are not put out by the rain at all. This one stayed out in the rain for over two hours before slowly and casually walking on. This looks like a perfect resting spot — a few moments of shut-eye before heading in for the day. The huge trunk on which the coyote rested was about six feet off of the ground below. This story hinges on human conduct, which is always the cause behind coyote “incidents”, and also the route through which misinformation is turned into nasty rumors. The only way we can control coyote behavior is through our own behavior. Leave them alone, and they will leave you alone. So, the day began peacefully, as usual. Very often, when coyotes are out early resting on a hillside, a group of unleashed dogs will aggressively run up to their remote location and chase them. It is always the same group of dogs with the same set of owners who have never taken responsibility for keeping their dogs away from the coyotes — this group is one of the few who are not fond of having coyotes around. Ninety-nine percent of dog owners, however, are respectful and want to do what they can for the urban coyotes. They are totally responsible, keeping their dogs leashed or under voice control when coyotes are out. Repeated “incidents” always occur with the same few dogs. Fortunately, today the coyotes were not out when these dogs went by. However, not long after they passed, a coyote did appear up on a hilltop, observing her surroundings. We know it was the mother coyote because of the behavior which followed. Several groups of walkers stopped to admire her presence in the park as she sat so calmly looking around: this was magical urban wildness. It was all so peaceful. Then the coyote jolted to a sitting up high position: her attention became riveted into the distance. She ignored the walkers below her. And then, as suddenly as she had sat up, she darted off like a bullet at full speed with hackles raised. A few of us who just a few moments earlier had been watching her peacefulness, headed off to where the distressed barking sound was coming from. On the way we passed the angry owner of the dog which had chased the coyote — she now had her dog leashed. This huge dog continually chases the coyotes — it is a game for the dog who is about four times larger than any coyote. The owner wouldn’t even look at us: for her, the incident was the coyote’s fault for being there — not hers for not having leashed her dog. We walked a little further until we spotted the mother coyote: she was rearing up on her hind legs and barking. The young coyote which had been pursued had taken cover in the bushes, but the second young coyote sat on the hillside nearby watching as its mother continued her barking for about 20 minutes. The reactions to this incident were various: these are the reactions which get reported to our Animal Control Department. Some people were furious that a dog walker had allowed her dog to chase a coyote again — and that dogs are not kept leashed in this “leash-law” area. Some were just fascinated by the barking, and fascinated that a mother coyote would run such a long distance to defend one of her year-old pups from a dog. Some twisted the information to fit their own image of coyotes, saying the coyote had not been chased at all, that she was aggressive and bold and a danger to humanity. And finally there was the individual who points to observers or photographers so as not to have to address his own reasons for not leashing his dog. It was nice having the witnesses who saw the young coyote chased by the German Shepherd. More and more people are willing to give their names to defend the coyotes and I want to thank them all. When a coyote defends itself or its pack members, it is not an act of aggression or an attack. In fact everyone needs to become more aware of nuances in terminology so that they may be able to describe what they see more accurately. Lynsey White and Stanley Gehrt of Ohio State University point out that the phrase “coyote attack” is sensationalistic and fear-mongering. We need a better choice of words and consistency to better understand how coyotes actually interact with humans. People often conflate words like “aggressive”, “assertive”, “bold”, “curious”, “defensive” and “investigating”. Details of the behavior of people, dogs and coyotes prior to and during any coyote incident are needed to really understand what is going on. Our mother coyote finally calmed down. I watched her slowly head down a hill and into the bushes and finally up to one of her remote lookout posts, where she gave one last glance around to make sure the German Shepherd was gone. Then she lay down and napped. A couple of hours later I returned to the park to find her still in that same spot resting. Coyotes just want to be left alone. If you leave them alone, they will leave you alone. Please keep your dogs leashed around coyotes. Several times I have watched a coyote settle down in a spot, look around, and finally curl up for some sleep, right in the open. It is not exactly in plain view since the coyote is so well camouflaged — it would be very hard to detect that a coyote were there if you had not seen it go there in the first place. However, a few days ago I actually discovered this coyote sprawled out asleep in the wide open. By zooming in with my lens, I could see that the coyote opened one eye and was aware of me from quite a distance, but it did not raise its head. It did not move at all! I’ve put three zooms in here to show how absolutely hidden the coyote is — but the coyote is there!! 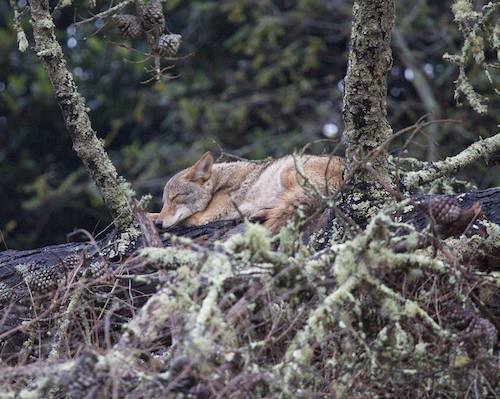 Where do coyotes hunker down for their rest? It appears it is right under the open sky in plein air, and not necessarily in the bushes!! I followed a coyote for about ten minutes as it hunted, it moved on a little, it sat and watched, and then it moved on some more, repeating this sequence. I moved on, too, behind it. Then it sat down and glared at me a couple of times: “yea, what do you want.” I was getting ready to abandon the coyote when it moved one more time, so again, I peeked over at it. At this time of year the grasses are very tall and I could not see through them very well. However, I could barely discern that the coyote had stopped where another coyote was already lying down — I could just barely make out the ears. This second coyote did not get up. Instead, the first coyote lay down right beside the first!! My own wanderings and observations had obviously ended for that day! I’ve heard that coyotes actually only use their dens for the first five weeks or so of life, and that slowly they move further and further off from the den area for resting. My thought is that, by varying resting and sleeping locations, the coyotes are actually keeping fleas from building up in an area. These coyotes do have fleas because I’ve consistently seen them scratch themselves. I was able to see some interesting behavior today — all within about an hour! Each of these observations coincides with one row of three photos above. I saw a shy, yearling coyote join its mother on a lookout rock above a trail. But the young one didn’t stay long: its self-protective instincts are strong. A dog walker and his leashed dog came in their direction. The walkers did not see the coyotes, and even if they had, they were 50 feet below the ledge where the coyotes were and could not have reached the coyotes. The minute the young coyote saw them, it took off, lickity-split, and I did not see it again. I’ve seen this coyote flee quickly when it thinks it has been seen! The other coyote stayed relaxed and calm, watching the occasional walker go by below. This coyote was actually on the edge of another, higher, less used path. Today, someone came walking along this path. The coyote bolted into the shadows only 5 feet away, but it did not run off. The walker walked on without ever seeing the coyote. The coyote watched the walker leave, and then it went back to its previous resting spot. I noticed tongues today — tongues sticking out. I have noticed this before in conjunction with both dogs and coyotes who were concentrating intently on each other as they tested each other face to face. I wonder if there is a correlation with concentration and possibly even making a split-second decision? The coyote in the 3rd photo appears to be just “licking its chops”, I think. Coyotes are extremely attuned to the dogs and walkers that have confronted them. Coyotes have the same anger and fears that humans have. Few humans are willing to recognize this, but one only has to observe to see it. So when a woman and her unruly, unleashed dog walked by on the path below, this coyote became very agitated. This dog has chased the coyote, and the woman throws stones at it. First the coyote stood up to watch the two approach. When they were directly below, the coyote began grunting its displeasure and almost began a barking session. The coyote was preparing itself for the habitual antagonistic behavior from the dog and walker. The woman and dog walked on without going after the coyote, so the coyote calmed down and remained in this spot a little bit longer before moving on. I then followed this coyote a short distance as it poked its nose into the ground now and then. While it was doing so, I noticed two squirrels playing at the base of a tree. Just as I was wondering why the coyote had not seen them, the coyote did notice them and ran to the trunk of the tree. It sat there a few minutes, but obviously could not climb straight up a trunk, as the squirrels had. Maybe this had inspired this coyote, because then I watched it climb a tree! This was not a totally vertical tree. Rather, it had grown at an angle such that a coyote could walk up it and search for squirrels. There were none. The coyote in the tree was about ten feet off the ground.